These Spicy Kale Chips are always scarfed in record time! 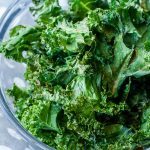 They're crazy easy and totally tasty with my trick for ultra-crispy kale chips! Rinse and dry your kale thoroughly. You can allow it to air dry, spin dry in a salad spinner, or pat dry with paper towels. Tear kale leaves off their stem/ribs into pieces the size of potato chips. Lay, spaced, on a wire baking rack and place atop a foil lined cookie sheet. If you're making a boatload of kale, make two sheets/batchs so they cook evenly. Spritz lighlty with a natural cooking spray or drizzle a little bit of oil in your hands and lightly massage it into the kale leaves. The key to crispy kale chips is to coat lightly in oil without getting too much liquid on the leaves. The wire baking rack also ensures maximum crisp factor. Sprinkle with salt, garlic powder, and cayenne pepper, to taste. The more cayenne you use the spicier they will be. Want them super mild? Skip the cayenne or try sweet paprika instead! Bake sheet on the center rack for approx. 18-20 minutes until edges are crispy.